Rectangular stone tablet with pedimented top surmounting a rectangular black marble backboard. Incised inscription in gold painted lettering. 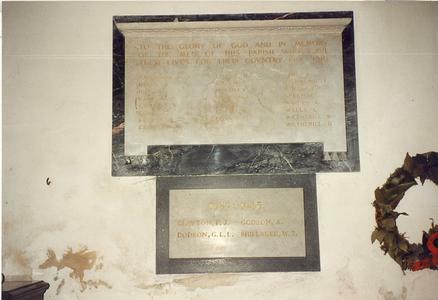 Additional plain stone tablet with the WW2 names inscribed upon it is mounted onto a black marble backboard and has been placed directly below the WW1 tablet.